In fact all these answers are wrong, and the first Lotus with these features was built in 1952 by the Lotus Engineering Company (not Limited in those days) to the order of Clive Clairmonte for racing in the then Formula 2 class of 2 litres unsupercharged. 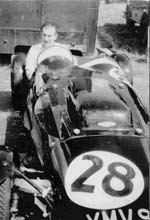 John Teychenne was a schoolboy friend of Colin Chapman and later started the Progress Chassis Company to make the chassis frames for the Mark VI, the first production car made by Lotus. During the hectic racing season of 1951 when Colin teamed up with Nigel and Michael Allen to build the Mark III Lotus 750 Formula sports racing car, John would help them run in a rebuilt engine every Friday night after replacement of blown pistons etc., ready to race the next day. Both John and Colin used to go to the Hornsey swimming pool in Park Road, near to John's house. Walking there the road took John past Shanklin Road where he used to see Fiat 500s and Cord saloon cars being worked on in the road outside the Clairmonte works. Clive Clairmonte ran a successful light engineering business with his brother at Shanklin Road, Crouch End, some 3/4 mile from the Lotus Works at Hornsey. During the war they had made parts for aircraft production. Clive had always been interested in motor cars and started dealing in used Fiat 500s and importing the Cord saloon car from the USA. Clive's first race is said to have been in a Cord, which he won. 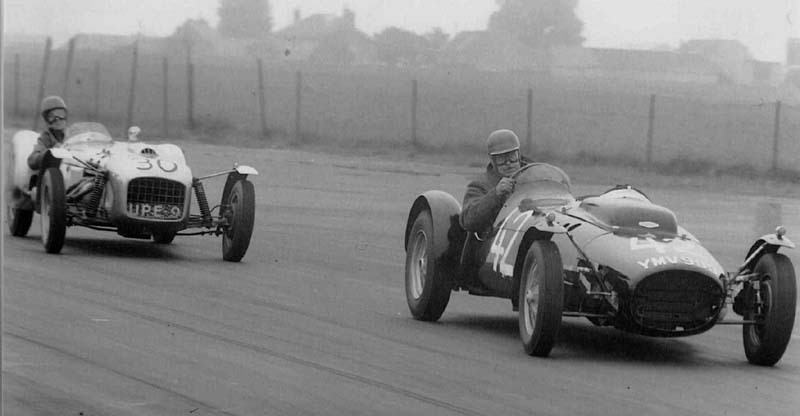 By 1951 Clive was racing the ex-Hector Dobbs 2-litre Riley Special racing car. It had a six-cylinder Riley engine with six Amal carburettors, was unsupercharged, with an orange stripe down the side, and was also known as the ex-Kelly Riley-IRA, the initials standing in this case for Irish Racing Automobile. Clive entered seven races in the 1951-53 period. Most were in the Racing Cars up to 2000cc class and he was up against quick cars like the HWM, Alta, BMW, Frazer-Nash and Connaught. After his first season he must have decided that he needed the lighter weight and better cornering power of an up-to-date chassis if he was going to do any good in 1952. Returning from swimming John stopped and introduced himself. He and Clive immediately hit it off, and they became good friends. With John's connection with Lotus the conversation soon turned to what they were doing, their plans for the Mark VI with proper space frame, and John convinced Clive that he should get Colin to design him a car. Colin was very interested in the idea of someone financing the building of his first single-seater, and told John that if he could get the order, he (Colin) would give him a job at Lotus, where he would be responsible for making it. He got the order from Clive and gave in his notice to Poplar Council, starting work at Lotus early in 1952. Clive paid Lotus Engineering £250. Colin probably designed the car during the winter of 1951/52, soon after completing the design of the Mark VI. Seven being the next available number, the car was called the Lotus Mark VII. The new Lotus Engineering Company (not Limited in those days) came into being on 1st January 1952. They had just moved from the Allen brothers' home at Vallance Road, Alexandra Park to Colin's father's Railway Hotel in Tottenham Lane, Hornsey. Colin and Nigel Allen would continue their day jobs (Nigel was training to be a dental surgeon). They would work at Hornsey in the evening and at weekends. Michael was initially the only full-time employee, with Mike Madden joining soon afterwards with John Teychenne. Their first job was to complete the Lotus Mark IV trials car for Mike Lawson, which was delivered in March in time to be entered for its first trial. The team were itching to get on with the Lotus Mark VI, but cash-flow made it essential that no customer should be turned away! At this time the Allen brothers and Colin were working hard on the new Mark VI in their spare time, whilst during the day Michael Allen, Johnny and Mike were doing jobs for customers and Johnny was trying to find time to make the Mark VII. Clairmonte had ordered a rolling chassis with body, but the Riley engine and gearbox and the Halibrand final drive unit were supplied by him. The latter allowed a low position for the prop shaft. The step up gears at the back of this unit brought the drive line up to the centre line of the crown wheel, and the transfer gears could be quickly altered to change the axle ratio. 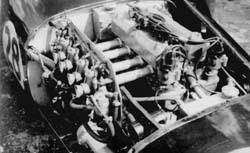 Clairmonte supplied a slave engine block to allow the engine mountings to be correctly positioned, whilst continuing to race his "hot" engine in the Riley. As can be seen from the features listed in the first paragraph of this article, Colin was determined that his first single-seater would have a really up-to-date specification. The chassis was a fully triangulated space frame. The front suspension featured coil springs within dampers, and the lower wishbone used streamlined section tubing. 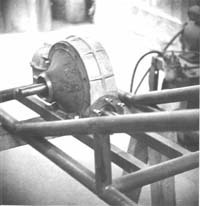 The de Dion tube was located by twin trailing arms and laterally by a roller on the tube sliding within a vertical channel. Brakes were 11" diameter, the rear ones mounted inboard to reduce unsprung weight. Because of the radically new front suspension (seen previously only on a 1948 4CLT Maserati Grand Prix car) this was the first part to be built. 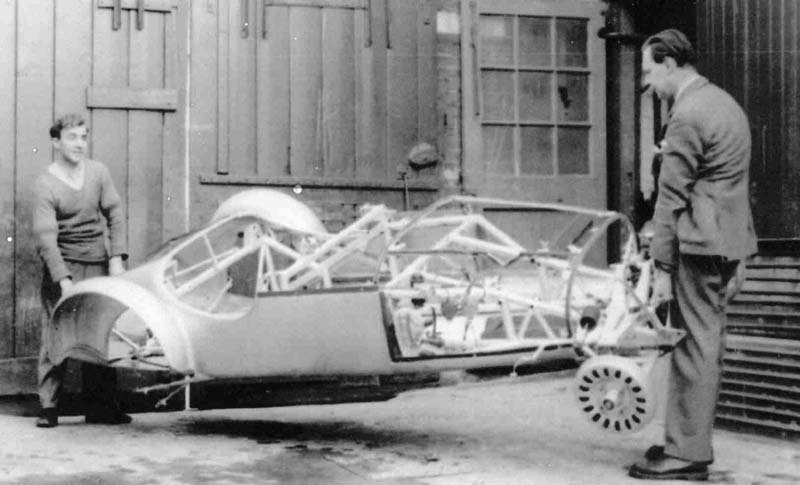 The chassis frame slowly took shape, but after about three months the little Lotus company began to run out of money, and John and Mike had to be laid off. John got a full-time job, but would come over to Lotus in the evenings to carry on with the Mark VII. About this time Adam Currie decided to buy one of the two uncompleted Lotus III team cars, to be fitted with a Ford 1172 engine. He would be helped by Peter Ross (the author of this article). This provided much needed cash-flow for Lotus, but meant that there were now two customers wanting their cars before the end of the season! The works Lotus Mk VI was finished and entered its first race on 5th July. During visits to the works to get various little bits of welding done for Adam's car, Peter remembers seeing the Mark VII having its engine mountings fitted. Because the Riley engine was so heavy, Nigel had turned it upside down and was lifting the chassis on and off the engine after tack-welding the mountings in place. About September 1952 Clive Clairmonte's patience finally ran out, and he collected the frame, with front suspension, engine and the Halibrand final drive unit fitted, and took them off to his factory. 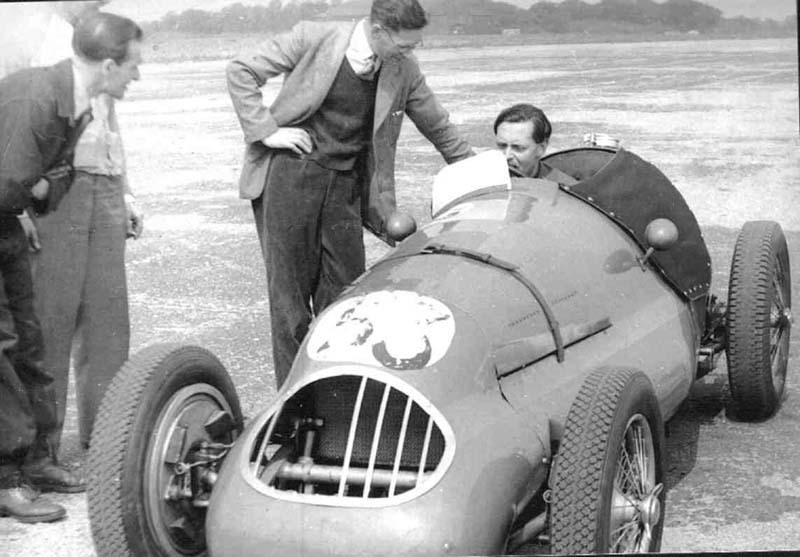 His Riley engine had blown up, and he decided to convert his Lotus into a sports car to race in the 1500cc class, with a four-cylinder Lea-Francis engine of 1496cc capacity. From now on his mechanic Fred Boon (always known as Sorrento because of his Italian appearance) was going to be very busy! The upper lengthwise frame members were cut at the engine bulkhead, and the lower ones left in place. Wider upper and lower tubes were added, angled on to the original tubes beside the engine. The rear of the frame was widened to accept the coilspring/damper units in a more upright position. It is likely Colin Chapman would have given Clive the drawings he had done for the rear end, the rear suspension, de Dion tube and hub carriers, because those made are very similar to the layout used on Colin's next car, the aerodynamic Lotus Mark VIII, although in the latter case the springs were entirely different. Four-stud Dunlop wire wheels were fitted. These would not fit onto the front Alfin drums until each drum had been meticulously filed to allow the spokes to clear the fins on the drums. According to Len Pritchard of the famous coachbuilders Williams & Pritchard, the car was then brought round to them for the shapely body to be created. In the Spring of 1953 the car was finally ready for the road. Clive decided to call it the Clairmonte Special. He registered it with the number YMV999 on 29th April 1953 and entered it for its first race on 27th June 1953. Dave Kelsey (partner with John Teychenne in the Progress chassis company) recalls: "The first I knew it was even running was when John T turned up at my house one morning. It was finished in glossy black and made a most impressive noise when John and I gave it its first blast up Muswell Hill at a considerable rate of knots, collecting a speeding ticket en route. Half way up the hill, Freddie Boon popped up - he lived in a side turning off the hill." Its first race was at the MMEC meeting. It came 2nd to Peter Gammon’s MG in the up-to-1500 cc sports car race. The outing was followed by races at Snetterton (11th July, 1st August and 12th September) and Silverstone (14th August and 10th October) resulting in 3 firsts, 2 seconds and 1 fourth, 1 sixth and 1 seventh. This performance was highlighted in Autosport of 26th February 1954 where the Club Racing Survey called it "one of the most successful home built cars". Taking stock of his 1953 season Clive Clairmonte could see that although he had managed to beat the rapid Peter Gammon in his TC MG Special, he was going to have to do even better next season, because already the Lotus Mk VIs of Phil Desoutter and Colin Chapman with their diminutive 1172cc side-valve Ford engines were proving a threat, and Gammon would be using his potent MG engine in a Lotus Mk VI in 1954. The Clairmonte Special had started life designed for a 2-litre engine, and the transmission, brakes and wheelbase had been intended for this power and weight. The weight involved was too much of a handicap for the 1500cc class, so he decided to buy a 4-cylinder 2-litre Connaught engine, and take on the Bristol-engined cars. A new front roll-bar was fitted. 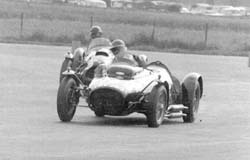 The MMEC meeting at Silverstone on 5th June 1954 was its debut in this form. In spite of rear brake trouble which caused two retirements, it had a 2nd and a 3rd with Peter Gammon’s 1500cc Lotus VI MG beating it by 0.02 seconds. It achieved a 3rd place in the USAF Trophy Race at Snetterton on 19th June behind the Sports Cooper Bristol of Jack Walton, and Gammon. 1955 started with a class 2nd in a Speed Trial at Wormingford Airfield (3rd April) and a 3rd behind Archie Scott Brown [Lister] and Mike Anthony [Lotus-Bristol] at Ibsley (30th April). 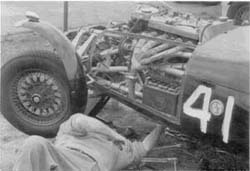 On 14th May the car went backwards into the bank at Silverstone’s Woodcote Corner and was reported as being "very bent", but was repaired in time for the 25th June meeting at the same circuit. The car was offered for sale in the 26th August edition of Autosport. Its last race with Clive was on 3rd September when he won all three of his races at Silverstone. It was entered for sale by auction on 7th April 2004 and was bought by Peter Ross and David Harvey who, in addition to restoring the Clairmonte to race in historic races, will build a replica of the original single-seat Lotus Mk VII. This is an abridged version of the full article by Peter Ross on Supersevens.org.